There is nothing more quintessentially spring than asparagus (or Crocus buds or Daffodils) so when Winter is looming on my doorstep I retreat to Spring foods to make me feel warm from the inside out. 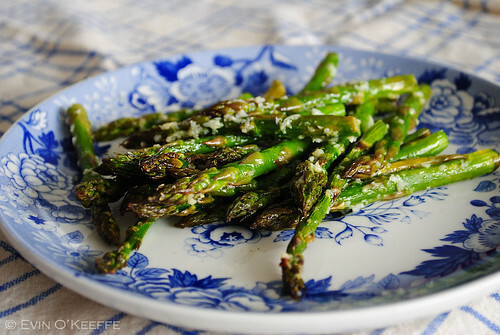 Roast Asparagus Spears can be a pleasant side dish to almost any main course and it’s vegan. The recipe itself is straightforward not needing any additional sauce or dressing before serving. I’m sure you can solicit equally sage asparagus-related advice from the manager of your local produce department but in case you’re not much for asking directions here’s what I know. Be selective when shopping for asparagus. Just like cut flowers, once trimmed from the plant, asparagus will begin to dry, wilt, and fade. Look at the bottom of the spear to see if the end is freshly cut or if it is dried out. The thickness of each spear matters less than the freshness. 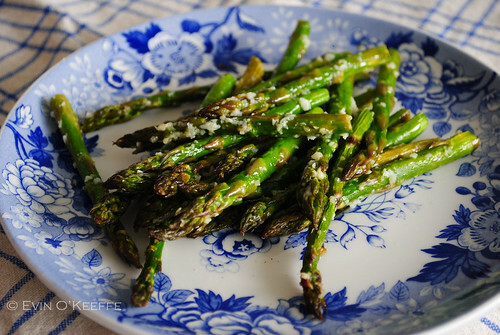 Once you’ve chosen your favorite bunch of asparagus, you should pamper it a bit. Asparagus reminds me of African Violets, which are often thought to be a challenge, but really they take care of themselves. Just as you leave water for the violets to drink, you need to provide water for the asparagus to replenish its lost moisture. I always place the bottom ends (not the tips) into a jar with almost an inch of water, and cover them with a plastic bag. Refrigerate the spears in the warmest part of the fridge for up to two days. Nothing horrible will happen after two days (they won’t turn poisonous), but the flavor will deteriorate and the texture will be tougher. I recommend the warmest part of the fridge because sometimes there are very cold sections that reach frosty temperatures. After all, asparagus sprouts after the last frost to avoid such unpleasantness. This entry was posted in Lunch | Dinner and tagged Cooking, vegan, Vegetarian.